Pomo Bluffs is a headland on the south end of Fort Bragg's Noyo Bay. It is now a city park that has a nice paved walkway with interpretive information and amazing views of the Pacific Ocean. The north end of Pomo Bluffs where it juts out into the ocean is called Chicken Point. Fishermen/women and urchin divers call it Chicken Point because that is where they go and look at the coastal conditions and decide if they are going out or chickening out that day. Chickens is a name that local surfers have called it. It has a reef break that on a good day produces overhead to double-overhead waves with nice left shoulders. The trick is that surfing the break becomes a game of chicken with the rocks that are scattered within the break. Needless to say, one doesn't see it getting surfed too often. 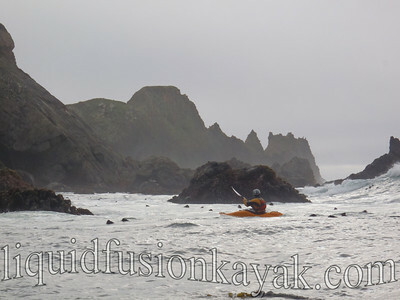 Chicken Point is always a point of wonder and awe when we are kayaking in Noyo Bay. On a very flat day, one can paddle around the rocks of chicken point. It is beautiful and fascinating with a healthy and colorful intertidal zone and a rugged rocky backdrop. 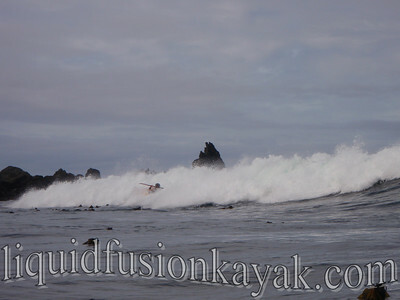 On typical days, it is awesome to watch the waves roll through the reefs at Chicken Point. It is exciting to sit on the edge of the breaking waves and witness the power of the ocean engulfing the rocks. To those that surf, we are mezmorized by her dangerous beauty. 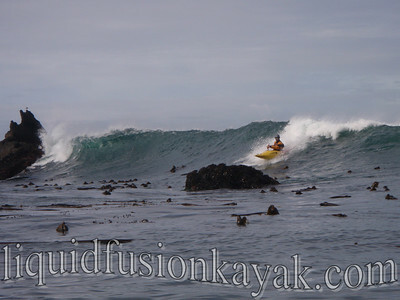 We try to visualize a line to surf through the maze of spilling waves guarded by the rocks. Jeff is not one to be disuaded by rocks and I remember the first time that he and our friend Josha surfed Chickens. WOW!!! As we rock garden in Noyo Bay, Chicken Point draws us like a magnet. Surfing Chickens is a bit out of my comfort level, but I have become comfortable enough with the break to position myself on the edge to watch and take photos. I am always stoked to see those with the skill and the nerve get in there and surf her waves. Jeff has been encouraging me to get in there and catch a ride. 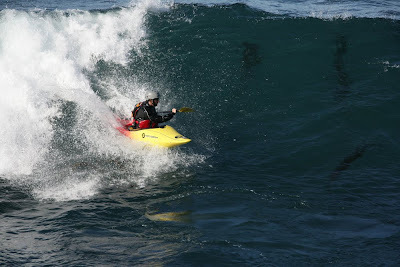 Several times, I have eased myself into the break only to withdraw (chicken-out) when looking at the wall of water building behind me and doubting whether I have the composure and skill to surf the wave and not be caught in the foam pile and swept into the rocks. It is very fun to watch Jeff. Many days the waves are just to0 big and scary to even tempt me but I am drawn to the challenge and really want to be able to surf it. In preparation, I have started getting my rock gardening boat out more in the surf zone to hone my skills, focus, control - and most importantly my confidence. Occasionally another paddler will be in town and be game for surfing Chickens with Jeff. 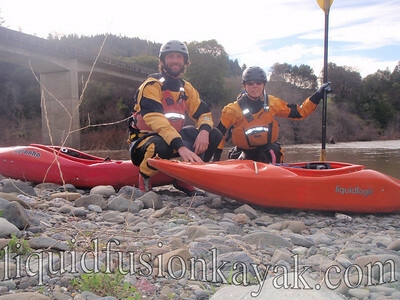 Several weeks ago, a skilled whitewater kayaker and his girlfriend were passing through town and connected to paddle with us. Chicken Point lured him from the moment he drove into the parking lot of the beach. As we rock gardened and played in the bay, she kept beckoning to him. His creekboat was not the idea craft but good paddlers have a way of making things work - check it out in this video (below but best if you click the link and watch on YouTube). I have had this post in my mind since filming the guys this day but just haven't had the chance to write it. As I am writing it, I have had my first rides at Chicken Point under my belt. We don't have any photos or video to post, but I can tell you that I was not swept into the rocks and am now drawn even more than ever to surf Chicken Point. The Eel River is on my mind this morning with many thoughts - we haven't been on it much this year - the Willits Water Festival next weekend - our upcoming trip on its wilderness stretches - and those warm sunny days kayaking it last spring. 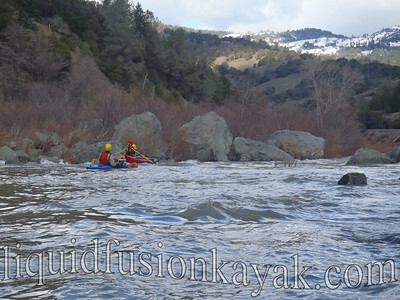 The Outlet Creek to Dos Rios stretch of the Eel River has been described as a Class III whitewater kayaker's delight. 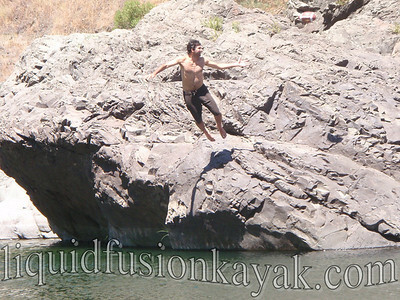 It isn't run regularly by a lot of boaters due to its location in the northeast corner of Mendocino County and because it is primarily a rain-fed winter and early spring run (making it a foul-weather run that is often chilly). This stretch of the Eel River is quite special to me because it is where I learned to whitewater kayak (I probably should say am still learning). Yes, my beginnings on this run were tormentous as many who were with us might recall. Fears and tears and of course lots of swimming. Jeff's patience and the strength of our relationship was definitely tested on our trips to the Eel River. When we started running the Eel River, I was a SWIMMER (in several senses - one being that I was a life guard and water safety instructor who swam regularly for fitness and the other being that I swam most of the time when I capsized). Fortunately, I was a good swimmer and usually self-rescued by holding onto my gear and getting into an eddy and onto shore. When we started boating on the Eel River, I had just relearned to roll. I had a decent flat water roll and was racking up combat rolls in the ocean surf and rock gardens; however, the river roll was eluding me. I hated capsizing for numerous reasons - the water was COLD, the air was COLD (problem with learning to boat in the winter), my playboat was not easy to roll, my kinesthetic senses were altered in the current, I was terrified of hitting my head on a rock, or being stuck in a hydraulic. Yeap - a TON of EXCUSES! My first season of boating on the Eel - I ran (swam) it twice and gave up on whitewater kayaking FOOORRREEEVVVEEER! It was too cold, too scary, and too frustrating. 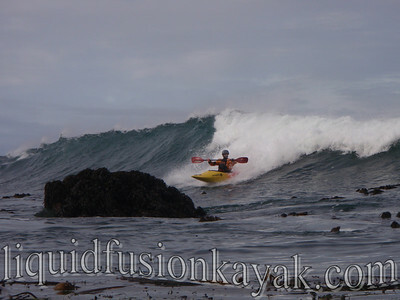 I continued sea kayaking and rock gardening and then even started kayak surfing. 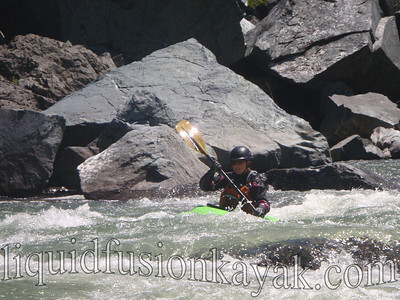 I saw photos and videos of the beautiful waterways that people were whitewater kayaking and felt a little sad when I stayed home while Jeff and our paddling buddies went river kayaking. In the winter of 2010, I became determined to master my fears and learn to whitewater kayak - so off to the Eel River we went. Some days we would just park and play (drill) on one rapid and others we would practice different skills while heading down river. I still managed to swim plenty; however, I rolled more than I swam. I am certain that I have swum every rapid on the Outlet Creek to Dos Rios section with the exception of Tunnel and CalTrans(Willow). In our sessions on the Eel, I realized many of my fears - hitting my head on a rock (the helmet has a couple of scratches but I am no worse for wear -I think- and getting stuck upside-down in a hydraulic and working my way out without swimming -took 3 rolls but I did it). The cold water is still a huge issue for me. The Eel River has some great surf waves and I so want to learn to surf, but I still prefer to keep upright in chilly fresh water. My kinesthetic sense underwater in current is improving with experience, but I still get disoriented. The Eel River has many firsts for me including my first combat river roll, my first time whitewater river kayaking without Jeff and I am excited about the prospect of my first multi-day wilderness whitewater trip. Will swimming be involved on this trip? I definitely hope so . . . when it is warm and sunny and not necessarily an out-of-boat experience. 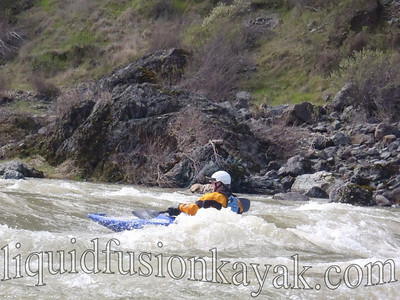 Sorry - no photos or videos of my swimming on the Eel, but this video might show a bit of the character of whitewater kayaking on the Eel (notice the contrast between the gray days of winter and the sunny green days of spring).